On this page, we’ll cover what you need to know to use the monorail, including info for people with wheelchairs, ECVs and other special needs. If you haven’t read it yet, you may want to read our article called Walt Disney World Transportation Overview for additional details on the monorail and other forms of transportation at Disney World. 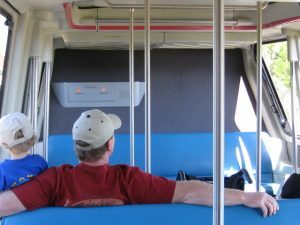 The Walt Disney World Monorail is a Fun Way to Get Around Disney! What is it? The Monorail is a part of Disney’s transportation system that’s available in certain parts of Disney World. It’s an elevated train system that runs on electricity. It’s so quiet you may not notice it passing by. The Monorail in itself is a pleasant ride, and we find it worth taking just for the experience. Personally I love looking at it. It’s so cool! 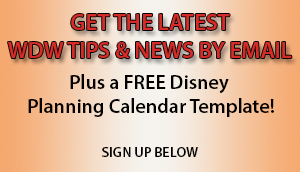 Express loop – This is for express service to the Magic Kingdom Theme Park and Transportation and Ticket Center. Second loop – This is for express service to Epcot and the Transportation and Ticket Center. Third loop – Called the resort monorail, this has multiple stops: the Polynesian Village Resort, the Grand Floridian Resort, the Magic Kingdom and the Contemporary Resort. This is an interesting loop that actually stops inside the lobby of the Contemporary Resort. You can change Monorail trains at the Transportation and Ticket Center to travel between Epcot and the Magic Kingdom. What are Disney’s Monorail cars like to ride in? The monorail cars are spacious, and there are large windows on both sides. The seats are padded benches with high backs. The padding is rather thin so the seat still feels hard. There are vertical grab bars in all cars. The motion of the Monorail is fairly smooth, but there’s a gentle, consistent jerking that will only be noticed by the extremely sensitive. Most people won’t be aware of this motion or feel that it’s uncomfortable at all. At times the Monorail may have to hold its position in between stations for a period of time to allow the train ahead to get a safe distance away. When this happens the train may stop abruptly, but it shouldn’t be abrupt enough to cause any alarm. On rare occasions they may actually test out the brakes on the train you’re riding, which can cause erratic movement within the cabin. They rev up the train to about 25 mph and then bring it to a halt. Before they begin this drill they’ll warn the guests. It’s not something most guests will experience. In fact, we never have. For details on Riding the Monorail with Wheelchairs and ECVs (electric convenience vehicles or scooters), visit here.